Put the whole eggplant as is, (only cut and remove the stem from the top), on a baking sheet and bake it. You'll notice when it's done that the juice came out on the baking sheet and the skin is almost toasted and it becomes soft when you punch it with a knife. Let it cool for a bit then cut it in half and remove the skin; just cut it roughly into pieces and put it in the salad bowl, it's ok if it has some juice still. Chop or dice the rest of the ingredients and add them as well. Finally, add the salt, pepper, lemon juice and olive oil. How long should the eggplant cook? The eggplants will roast in 25-35 minutes. but test it with a knife, it should be soft from the inside and the peel should be a little bit charred from outside. 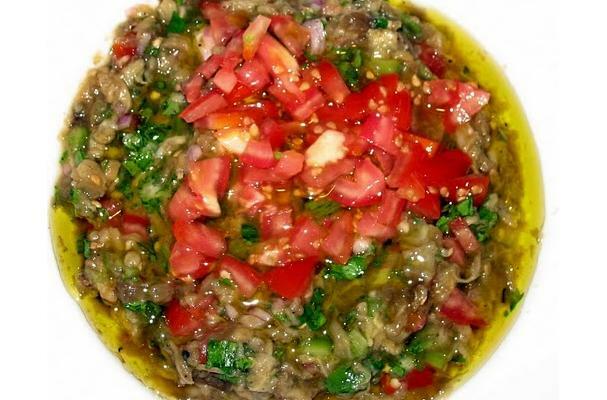 Raheb Salad, or Eggplant Salad is a great appetizer salad that is very easy to prepare. it has few simple ingredients that make this tasty salad.